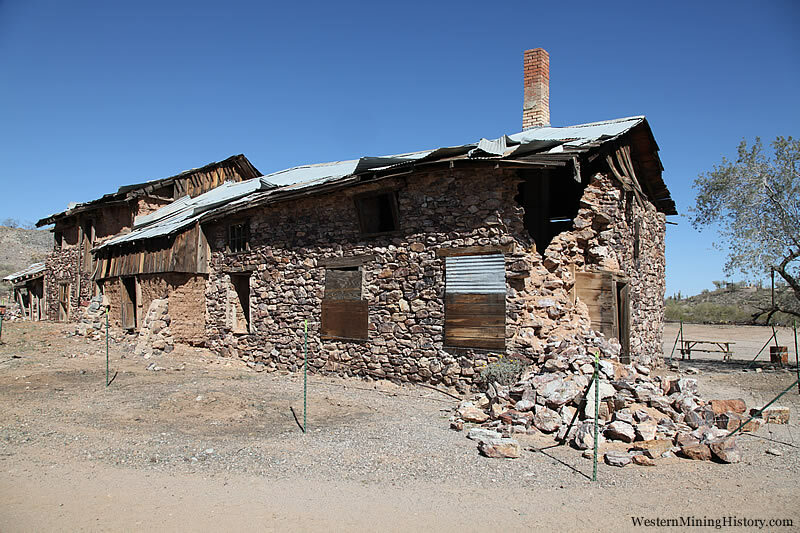 Vulture City is the settlement that grew up around the Vulture Mine, Arizona's most successful gold mine. Henry Wickenburg discovered gold here in 1863. In 1866 the Vulture mine began operations that continued on a fairly large scale until it was closed in 1888. The mine was active again from 1910 to 1917, during which time it yielded almost 2 million dollars in ore. The mine was reopened again in 1931 and remained active until 1945. Total gold production for the district through 1959 was about 366,000 ounces. About 250 ounces of this was from placers; most of the remainder was from the Vulture mine. Vulture City was notorious for its numerous hangings. It is said that eighteen hangings occurred from the ironwood tree that still remains next to the ruins of Henry Wickenburg's cabin. Many of those hanged were miners who were caught "high grading", the act of stealing high grade ore from the mines. Webmaster's note: I visited the Vulture Mine in February of 2012. New owners had taken over and were in the process of preparing the site for open-pit mining. Although tours were offered, many of the historical buildings were off-limits. I have read accounts online that describe the condition of the buildings here as rapidly deteriorating in the last decade or so. Although the new owners claimed that most of the town would be spared from the pit, I saw no signs that any preservation was being attempted at the site and survey markers led me to believe that mining could possibly swallow up some or most of the remaining town (if I can verify this one way or another I'll update this description). If you want to see Vulture City in person, I would recommend doing it soon.